I cut and planed the wood to become the frame for the top to sit on, this was a lot easier than the top as the wood was only 2” wide. 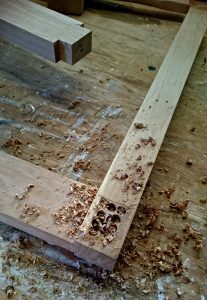 I then double and triple checked how I was going to make the joints – I decided to use my table saw to cut the tenon’s (the pin rather than the hole) as that would give me a uniform size rather than try to cut them by hand as I had previously done. After all of the tenon’s had been cut I moved onto the mortice (slot for the tenon to fit into) I know what you’re thinking – that’s the wrong way round to do it Jim! And yes, I realise that now, but at the time I hadn’t read that part. Anyway I marked up and numbered each joint to make sure they went in the correct place, lined up the first one and marked out the area I needed to cut away. I got my drill and made several holes to the same depth to make it easier to cut out. I then sharpened my chisel and started carefully cutting away all of the waste wood. I took my time doing this as I realised that any mistake would make the joint loose and look bad, like my previous attempts. After what seemed like hours I finished my first joint and it fitted perfectly! I was impressed with myself and very happy with the way it fitted together. Only another 7 to go!! After I finally finished all of the joints I was ready for the glue up. I went out and bought some more clamps as I didn’t have enough of the correct length to hold the frame together (you can never have enough clamps). I tried one final dry assembly just to make sure I had everything correct, then I glued the first 2 sections together and clamped them up. I waited 24 hours and took a look and was pleased that the glue was dry and the clamps had held everything in place without any movement, so it was still all square. Another dry fit and then I glued the final pieces in and clamped everything up. The frame was complete and my dads’ birthday was only 10 days away – I had to get this finished and quickly! I had already decided that I would finish the table in yacht varnish as this would give a glossy finish and be very hard wearing. 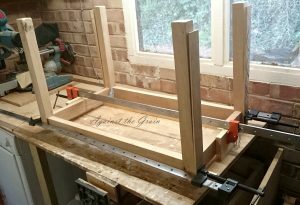 So I got the frame and placed the top on for the first time, it looked good to me, until I realised that I’d not sanded the top at all, I had only got as far as planing it flat! Out came my belt sander and 10 minutes later I realised that I wasn’t wearing a dust mask, glasses or any of the protective gear you should wear when sanding wood. I was covered in dust and sneezing. I took a break and calmed down. I still had 10 days to get the table finished, which would be plenty of time. I went back to it and carried on sanding, moving to my palm sander for higher grits to get it as smooth as possible. 4 hours later I finished, ran my hands across the smooth wood and thought how tactile and nice it was. I wiped it over with white spirit to remove any fine dust, opened a tin of yacht varnish and an expensive new brush. Then started to apply the liquid onto the wood, I decided to finish the top and frame separately for the first couple of coats to make it easier to cover everywhere. 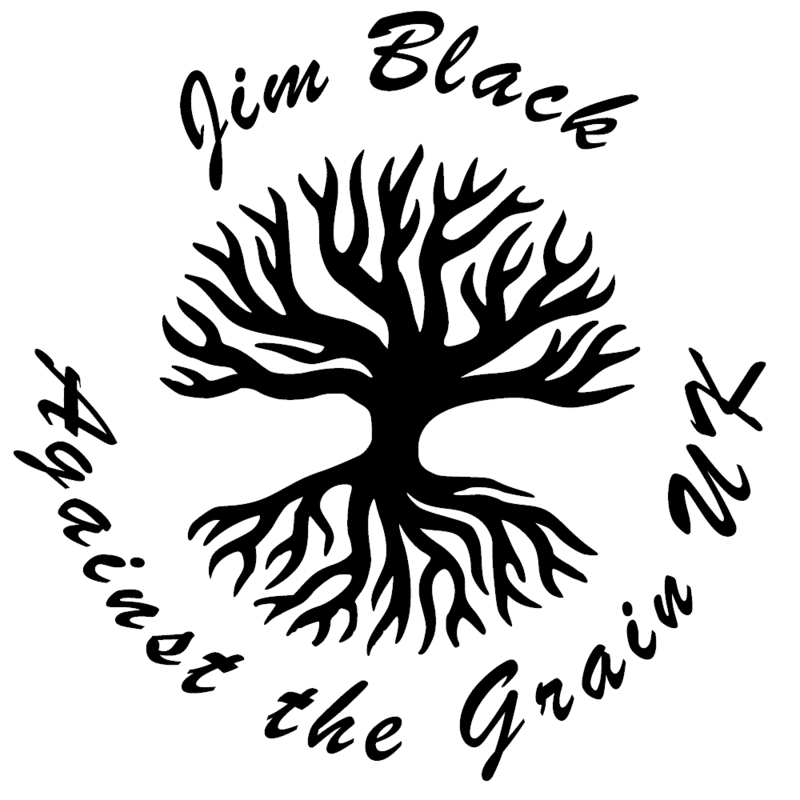 The grain which looked good after the planning and sanding now looked amazing, it ‘popped’ and looked a lot deeper and more ‘alive’ than before. I was shocked by the change in the wood that a simple finish can achieve. After the first coat I left it until the following day, but upon checking it the varnish it was still tacky and not completely dry. It was the end of October and pretty cold in my garage, so the varnish wasn’t drying as quickly as I hoped it would. The following day I checked again and thankfully it was dry. I lightly sanded it by hand with a very high grit paper to remove any little bumps in the varnish. I decided to move the table into the house where it was warmer and finish the varnishing in there. Thankfully the varnish dried a little bit quicker and I was able to apply 3 more coats to the table before my dad’s birthday party in a couple of days. Finally on the morning of the party I attached the table to the frame with ‘L’ brackets and screws after several minutes making sure that everything was square. The table was finished. I stood back and looked at it. I could see some minor flaws and mistakes in it, but my wife and daughter assured me that they couldn’t and that it look really good. I was proud of my efforts and how I had progressed from the crappy looking stool I had made 6 months ago.